Learn how to make homemade ravioli pasta from scratch. Including homemade filling ideas and delicious sauce recipes. Start a new family tradition today. Divide dough into 3 parts and roll out on a slightly floured surface into rectangles about 10 inches by 20 inches. Using a knife (or a pastry wheel), lightly mark the dough parallel to the long side in 4 inch intervals; mark it lengthwise at 2 inch strips. Your dough will now be lightly marked into 4x2 inch strips. Go across the bottom of the long side and place 1 teaspoon of filling about 2/3 of the way up on the strip. Fold the bottom half of dough up to cover the first row of filled raviolis. Cut across the dough to free the filled strip and cut into 5 individual ravioli. Seal the edges with a fork. Place on a lightly floured board. Repeat with the next row of 5 and continue until the ravioli are filled. Cook in boiling salted water for 6 to 7 minutes. Serve with your favorite sauce. 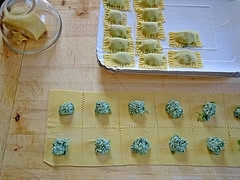 Prepare ravioli (above) with a filling of your choice. Seal the edges well and allow the dough to dry for 30 minutes. Fill a deep skillet 3/4 full of oil and heat to 350 degrees. Fry the ravioli in batches until golden brown on one side. Turn and fry until browned on the other side. Serve with dipping sauce: marinara sauce.